← Hello Foot, How Do You Do? 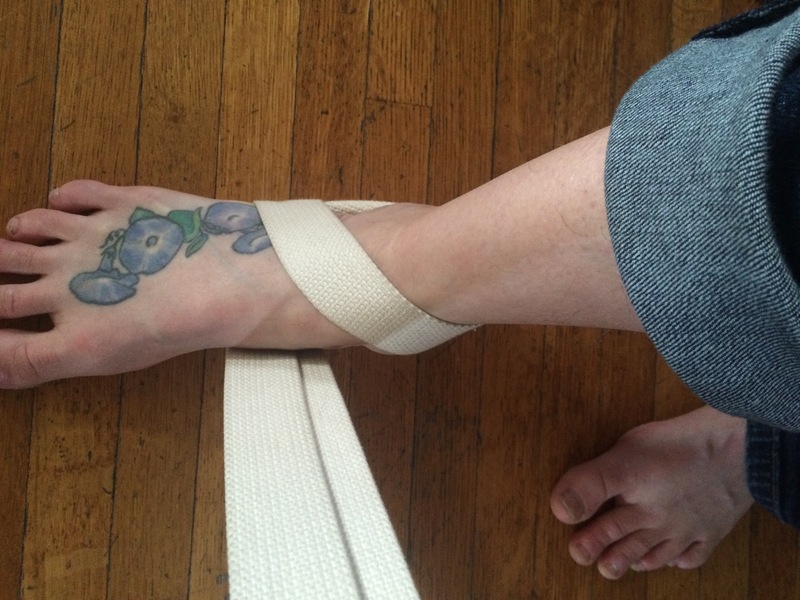 When I teach, I often cue the “strong yoga foot.” But its not just for yoga. I am standing at my DIY standing work station typing this while doing the strong yoga foot. You should do it too. Stand up right now. Stand with your feet pelvis width apart. Pelvis width means the front of your ankles fall directly below your anterior superior iliac spines aka ASIS aka your “hip pointers” aka the pokey bones to the right and left and superior to (above) your pubic bone that you feel on the front of your hips pelvis when lying on your belly on the cold hard floor. Straighten the outer edges of your feet. Shift your pelvis back aka back your hips up. Place your weight back into the centers of your heels. Press the balls of your feet into the mat without pressing the tips of your toes. Lift your arches. Really, lift your arches. If you can’t find the lift button, those muscles are not really firing, which is a problem. My friend Mel Robin has a great exercise in his book, A Handbook for Yogasana Teachers, for using a strap to simulate actions of the muscles on the lower leg (peroneus longus, peroneus brevis, and anterior tibialis) for achieving what he terms the “strong-foot position of Iyengar yoga.” These same muscles play a critical role in keeping your arches strong and intact. 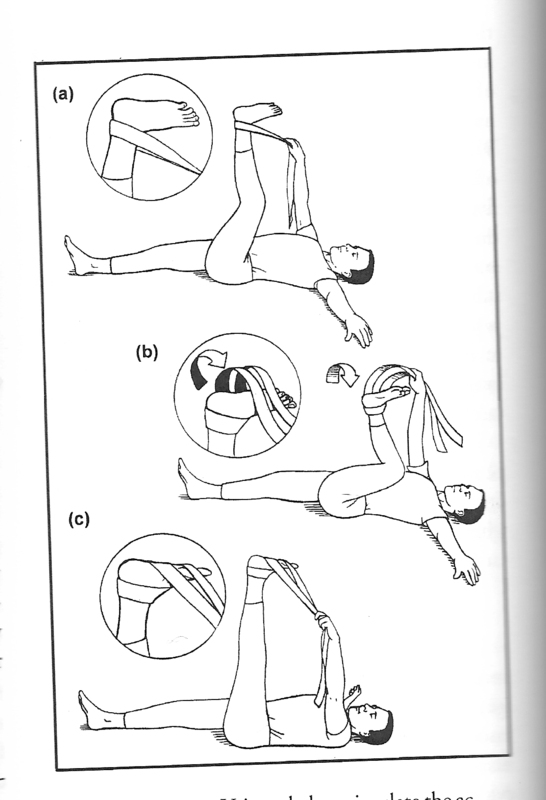 (b) With the left leg fully bent, take the belt over the sole of your foot, moving it in a counter-clockwise direction. (c) Hold the belt in the left hand with a slight downward pull and straighten the left leg. This pulling down simulates what would be the lifting of your arch if you were standing upright. I tried this standing up and it is a great method for training a weak, poorly innervated arch to begin to begin to lift on command. You can practice the strong yoga foot anytime your are standing – during yoga, waiting in line, standing around with friends, or even bird watching. This entry was posted in Asana, Feet and tagged foot exercises, strong yoga foot. Bookmark the permalink.